My HF antenna setup for the past few years has consisted of random lengths of magnet wire thrown into trees. For some time, I'd used an antenna tuner at the radio end of a coax feed, with OK results, but I knew I could do better if I located the tuner at the antenna. 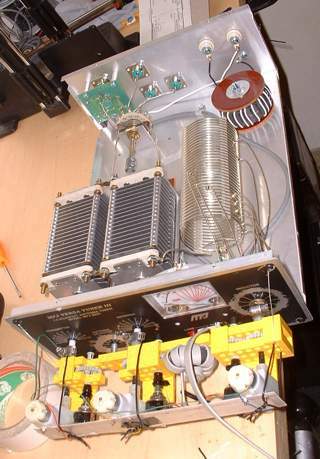 This project uses some small gearmotors purchased from Hobby Engineering to drive the inductor switch and the two air variable capacitors on an MFJ 1500W antenna tuner. The MFJ tuner with the motor drive attached. MFJ doesn't seem to sell the tuner I've got anymore, but this setup can be used on any tuner that has either an inductor switch where the spring detent system can be defeated or a roller inductor. The latter will require a gearing modification for the feedback pot, so that the entire range of the roller inductor can be accessed with only a 10 turn resistor. If you use Lego® gears like I did, that would be simple. The circuit is a simple proportional feedback controller. 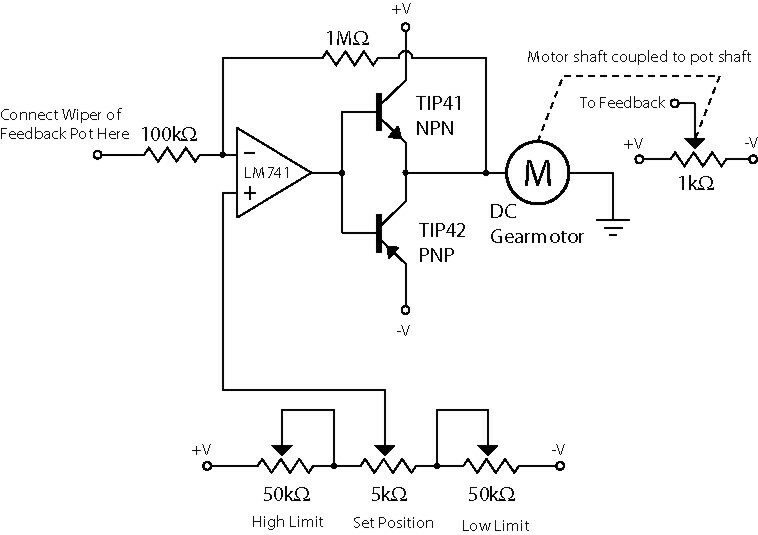 It feeds a voltage to the motor that is proportional to the difference between some set voltage and the voltage on the wiper of a sensing potentiometer. 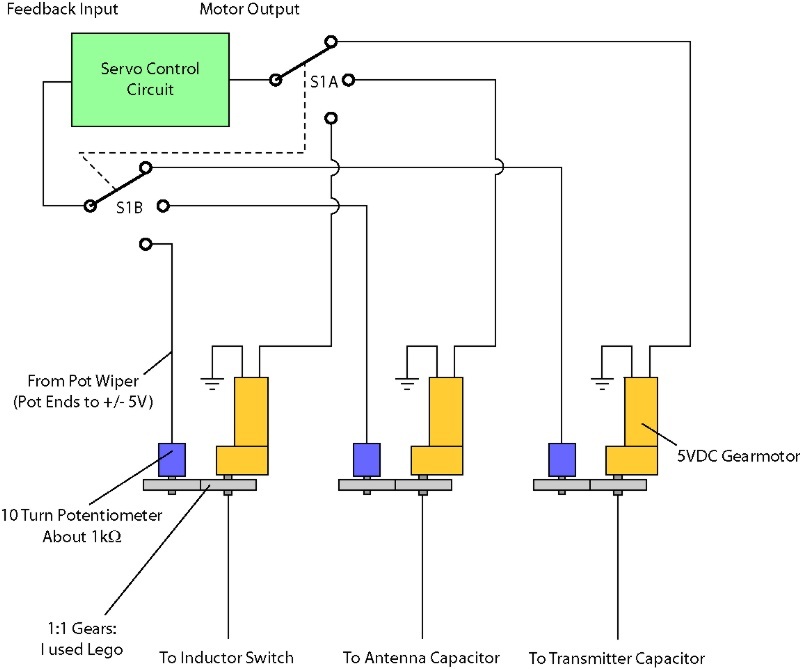 This causes the motor to turn until the voltage on the wiper of the 1 kΩ feedback pot matches the voltage on the wiper of the "Set Position" pot. You need a split supply to run this circut so that the motor can turn in both directions. I used a homebrew ±5V supply with a 12.6V centertapped transformer, a bridge rectifier, and a 7805 and 7905 plus and minus 5V regulators†. The "High Limit" and "Low Limit" pots are adjusted so that the range of the "Set Position" pot (about 300°††) maps to exactly one full rotation of a 10 turn pot. The values here will allow you to set anything between 1/2 and 10 rotations of the feedback pot. When the two limit pots are set to their maximum resistance, the voltage range available to the "Set Position" pot is only about 0.5V. Since the supply is 10V (-5V to +5V), this is 1/20 of the range available to the 10 turn feedback pot, and it will only turn 1/2 turn over the range of the "Set Position" control. If the limit pots are set to zero resistance, then it is as if they are not there, and the feedback pot will execute 10 turns when "Set Position" goes from minimum to maximum. The limit pots can be set symmetrically (the same resistance), but they don't have to be. Imagine they're set so that there was a 1.0V swing as you rotate the "Set Position" control (this is 1/10 of the supply, or ONE rotation of the feedback pot). This 1.0V swing is -0.5V to 0.5V if the limit pots are set exactly the same, but if you then rotate BOTH of the limit pots in the same direction the same amount, this range will stay 1V wide, but will no longer be centered on 0V. The utility of this is that you can set the angular start position of the feedback pot. If you set it so that the 1V swing is centered on 0.5V (range 0.0V to 1.0V), then the feedback pot will still make one rotation, but its center position will be 1/2 turn more than if it were centered at 0V. 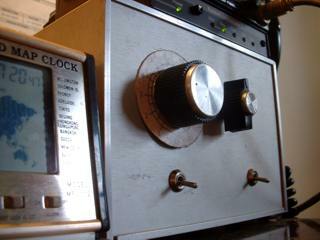 I used this to set the alignment between the "Set Position" knob and the inductor switch contacts. In my control box, I only wanted one "Set Position" knob, so I got a double pole 6 position (2P6T) switch from Radio Shack and used three of the positions to switch motors and feedback pots for the three different tuner knobs. I used a 6 position switch so I would have expansion capabilities. 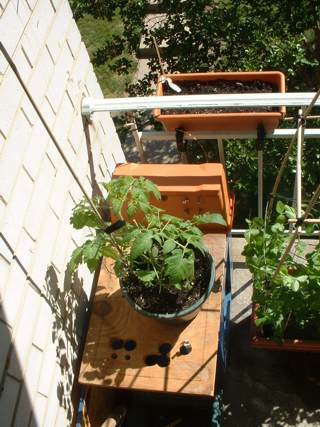 With this scheme, I set the "High Limit" and "Low Limit" pots to give one full rotation. This is more than you need for the tuning capacitors, which really only need to go from open to fully meshed. 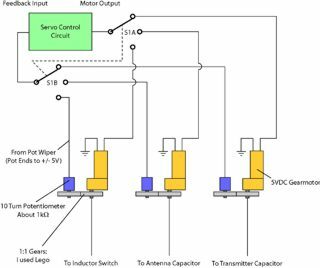 If you were to build a separate circuit for each motor and pot (or one for the capacitors, switched, and a second for the inductor), you could set the capacitors to go only 1/2 rotation, and this would give you finer control over tuning capacitance. I like the compactness of the controller as I built it, though. The controller parked underneath the KPC-3 and VHF radio. Here is the admittedly kludgey gearmotor setup. 1/4" plastic tubing and hose clamps were used for semi-flexible couplings. It's important that the tuner shafts not slip with respect to the feedback pot, so tuning can be achieved repeatably. Gearmotors, Lego® gearing, and feedback pots coupled to the tuner. I put a ferrite toroid here to keep RF from getting induced on the cables. I don't know if it's needed, but I figured it wasn't a bad idea. The wiring is 8 conductor telephone wire from Radio Shack. I used the coax shield as the 9th (ground) conductor. 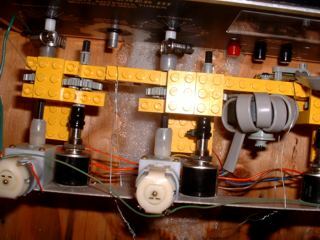 A closeup of one of the tuner motor assemblies. In the interest of stealth and aesthetics, I have a nice hidden installation for the tuner. I have two pairs of relay selectable studs with wingnuts attached to the "balanced" tuner output and usually just keep one shorted. I can remove the wires from the tuner in inclement weather. The tuner lives inside a box on the balcony. An inverted flower box serves as a rain shield. † This circuit is quite insensitive to power supply variations. You could skip the regulators, then all you need is a center tapped transformer and a rectifier. †† I made a dial for my tuner controller so that I could remember tuner settings for easier access. I made it in a drawing program, printed it out on a laser printer, glued it to some cardboard, and coated it with spray acrylic. My dial goes from 1 to 12 to match the number of switch positions on the inductor. Any scale will work for the capacitor. Take care, though, if you make a dial like this on a computer, it should start and end at the actual electrical limits of the "Set Position" pot. I didn't do this; I just measured the rotation of the pot, without checking the resistance. It turns out that all the pots I could find had a "dead zone" at at least one end, where a small change in angle made NO change in resistance. It's a small matter, the unit is still quite useable, but if you want the integer dial settings to line up with the contacts on your tuner switch, make sure you measure the angle over which the resistance actually changes. I put a switch in the line from the motor driver to the selector switch so that I could disable the motor rotation. This has been extremely useful on 17m where RF gets into the circuit and the motor starts oscillating, causing the SWR to do the same. You could also shut off the power to the whole servo circuit once you've tuned it. Make sure you build the circuit in a shielded box and use bypass caps to ground on all control lines. Chokes help too. The other toggle switch on the front of my controller just switches a DPDT relay for antenna selection purposes. There is a power switch on the back. Those of you who know motor control may point out that you can't control a DC motor using just proportional control without under or overshoot. 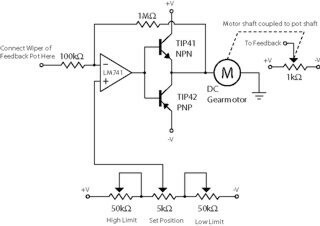 The problem is that the voltage driving the motor is proportional to the difference between the setpoint and where the motor is, but the motor will cut out at some voltage that is larger than zero. To fix this, I adjusted the gain so that I got a mild overshoot. 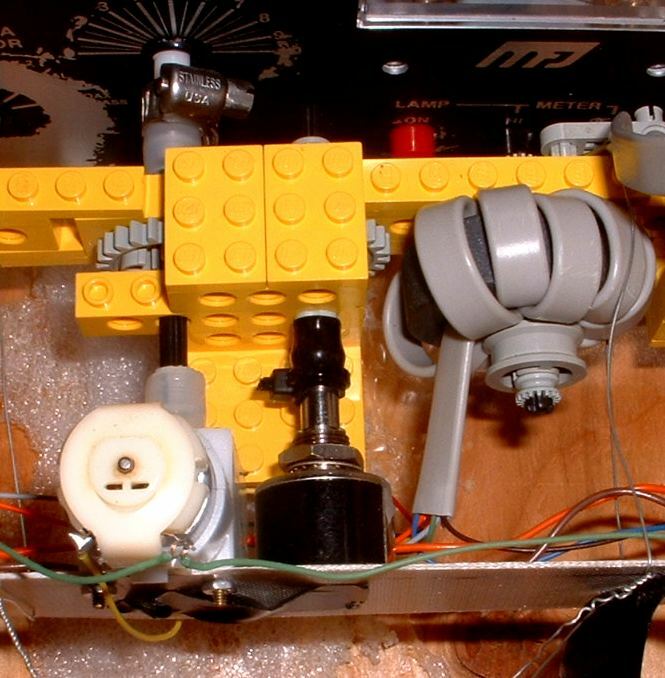 If you build this with different motors, a different tuner, etc, the gain might not be right. You might not be able to get to your desired settings without going past them with the control, or your motors might just oscillate if the gain is too high! You can change the gain by changing from the 1MΩ resistor in the circuit to some other value. Higher values give higher gain if the circuit seems sluggish. Lower values give lower gain if the circuit seems prone to breaking into oscillations. You should pick this resistor after you've hooked the motors and everything to the tuner, because the drag in the tuner elements will help stabilize oscillations a bit.